Extend the life of costly cosmetic brushes and wash away bacteria in one clean sweep. Use Sigma Spa’s Brush Cleaning Glove or Brush Cleaning Mat for easy, effective weekly cleanings using a clever design that walks you through each step. Labels on the different textured surfaces guide you to the right area for cleaning, rinsing, and reshaping. Swirl bristles along smartly designed grooves to deep clean hard-to-reach crevices. Sweep across the rinsing lines to wash away residue. Then reshape and restore with the specially designed edges, and your brush will dry properly and be ready to reuse. Preserve your investment while protecting your hands (and face) from makeup residue. Maker Sigma Beauty is an independent beauty company founded by husband & wife team Rene and Simone Xavier. With backgrounds in civil engineering and molecular biology, they were the perfect pair to identify an urgent need and design a solution. They want you to experience cleaner, better-performing brushes. After all, your face deserves it. 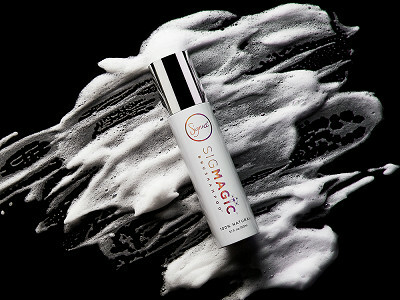 Sigma is one of the fastest-growing and top-rated companies in the beauty industry as a result of its ingenious and high-quality products. We're excited to launch our 2X Sigma Spa® Brush Cleaning Glove on The Grommet, and I'm here to answer any questions you have. Thank you, Brenda! Sigma developed the glove based on a strong need to quickly and effectively clean makeup brushes and we are proud of the innovation. @johanna Johanna, that is a great question! 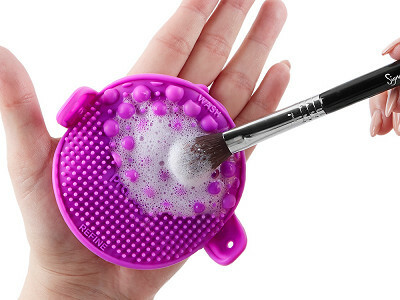 The 2x Sigma Spa Brush Cleaning Glove was intended for makeup brush cleaning, but can also be used for paint brushes. If you are considering purchasing the glove for your paint brushes I would recommend that you order the black one to reduce the appearance of stains oil paint may leave. From one artist to another, @johanna. I have used my brush cleaning glove for oil based products and found that an oily residue is left on the glove. The residue comes off easily with a grease-fighting dish soap. Also, be careful not to use a cleanser that will eat through the silicone. I always spot-test first! @Olivia Thank you for the great feedback. I am happy to hear that you already have the glove and that you are putting it to good use. As I stated above, the 2x Sigma Spa Brush Cleaning Glove was intended for makeup brushes, but its use can extend beyond your beauty routine! Do you use with soap? @Kaitlin is there any kind if "hair" brush that would not be good to clean with soap? I have an IT makeup brush and have tried unsuccessfully to find out how to clean it. Thank you! @Cheryl Cheryl, the glove has been tested with natural and synthetic brush fibers and it works well on both. 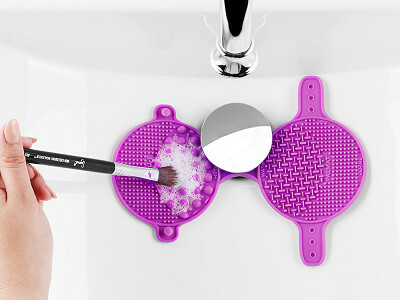 If you have not successfully found out how to clean your brush I would recommend trying the 2X Sigma Spa! @susan - Try using a liquid face cleanser to clean your makeup brushes. I use my liquid face cleanser and it works great at removing tough makeup like foundation and gel liners! This looks like a wonderful gift for my fiancé! As of now, she just throws her dirty makeup brushes away...thanks for thinking green! @Dan Absolutely! The glove is not only green, but an investment that will help you save money long-term. Hi Dan, Thanks for sharing your idea for giving this innovative and green gift to your fiance. Creative, eco-friendly products are so important to our community and when they're given as gifts, well that's just the icing on the cake. 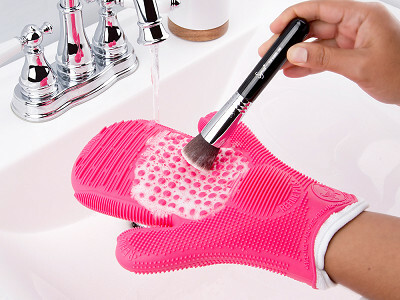 Hopefully your fiance will enjoy the 2X Sigma Spa® Brush Cleaning Glove as much as we do. Extend the life of costly cosmetic brushes and wash away bacteria in one clean sweep. Use Sigma Spa’s Brush Cleaning Glove or Brush Cleaning Mat for easy, effective weekly cleanings using a clever design that walks you through each step. Labels on the different textured surfaces guide you to the right area for cleaning, rinsing, and reshaping. Swirl bristles along smartly designed grooves to deep clean hard-to-reach crevices. Sweep across the rinsing lines to wash away residue. Then reshape and restore with the specially designed edges, and your brush will dry properly and be ready to reuse. Preserve your investment while protecting your hands (and face) from makeup residue.